Angelina Jolie says her kids’ adventurous appetites have forced her to step up her game in the kitchen. During an interview that aired Tuesday on Good Morning America, the 41-year-old mother of six gushed about her children’s love for bugs. “They can eat a bag of crickets like a bag of chips,” she said. The Oscar-winning actress shares six children with her ex Brad Pitt: Maddox, 15, Pax, 13, Zahara, 11, Shiloh, 10, and twins Knox and Vivienne, 8. And she told ABC’s George Stephanopoulos that all of her children enjoy a good, tasty insect. With her children’s refined taste, Jolie said she has to perfect her cooking skills. The actress and her children were in Cambodia recently, where Jolie’s passion project First They Killed My Father premiered on Saturday. They enjoyed a slew of insects, with Jolie showing little Knox and Vivienne how to prepare a few spiders. 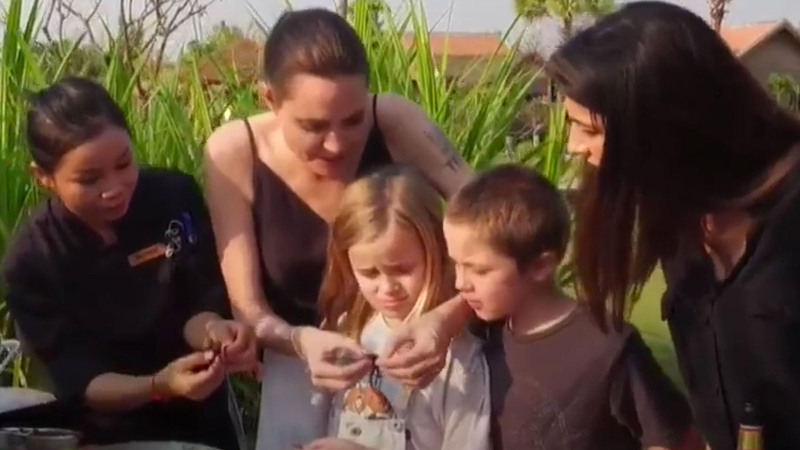 Although she may need to improve her insect-cooking skills, Jolie is no stranger to eating Cambodian bugs. The trip comes as Jolie and Pitt are in the midst of divorce proceedings. Jolie told Stephanopoulos that, despite the split, their family “will be stronger."